I’ve been using the Android framework RoboGuice 2.0 a lot lately. RoboGuice is an extension for the Google Guice dependency injection framework that adds several Android specific mechanisms to easily inject views, services or custom objects. Coming from an OSGi background, it is interesting to see how much deeper Guice is able to be interwoven into the Java code when your entire project is composed of injected classes. OSGi injects components on a much more abstract service level whereas Guice encourages injecting every class from a widget to a util class. Having such a loosely coupled project poses a new set of problems for testing the system. In theory it should be super simple to create tests for a Guice-based application but in practice several challenges have to be overcome when injecting test relevant classes. This blog post will walk you through a minimal project that uses RoboGuice accompanied by a test project that uses Robolectric and Mockito for test execution. To get started with RoboGuice we’ll create a simple project that is able to convert distances from feet to meters. Check out the screenshot below to see the UI in action. You can download the sample project and test project from here (the android.jar is omitted and should be linked in the test project). The first thing to do is create the main Android project and add the dependencies. To use RoboGuice you will need RoboGuice, Guice, javax.inject and the jsr305 library. You can find most of these libraries on the downloads page of the RoboGuice website (javax.inject.jar is in the guice-3.0 archives) and you can find the jsr305 jar on the Guice website. The next step is to create a regular Java project that will act as the test project. When running tests with Robolectric you do not run the tests in the context of a real Android device, but create regular Java JUnit tests. For the test project we need to add dependencies for the robolectric-all.jar and Mockito. We also need to add (or reference) an android.jar in order to have an Android version to run the test against. Check out the screenshot to the right to see the project setup in Eclipse. To run the tests, which are now available in the test project via the link, consult the Robolectric docs that go into detail on how to create an Eclipse test runner. It’s pretty simple actually. The sample projects even contain a convenient preconfigured launch config. To help you with all the project setup stuff you could also try to use Android Bootstrap. This code looks really simple and in fact, it is. All we had to do was to set our content view in onCreate() and attach our button listener. The wiring of the listener class happens in the super.onCreate() call, while the button is injected at the moment we set the content view. RoboGuice is then able to find the button via its ID in the layout previously passed in setContentView. 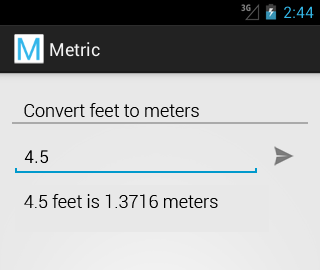 Your application should now run properly and be able to convert from feet to meters. Our test class has to use the RobolectricTestRunner, otherwise it cannot create Android UI elements. Looking at our test method we see that we only create a new activity, call onCreate() and assert something on a shadow object generated by Robolectric. If we hadn’t used Robolectric we would have had a hard time getting access to the listener because Android has no getter for it. The TestGuiceModule collects the active bindings and once Robolectric calls the configure() method we bind each object to its type. Note that we also bind the Activity.class to our custom ActivityProvider. This step is necessary since RoboGuice is not aware of the current Activity context is in which the app runs. Only when we create an Activity manually would RoboGuice have a context to work in. To see all the bindings Robolectric predefines for us, check out the class roboguice.config.DefaultRoboModule. Finally, we use the tearDown() method to revert our test specific bindings and return to the Robolectric default bindings. Calling bindListener() with a Matcher that accepts every possible binding attempt allows us to intercept bindings with our custom ViewTypeListener. In that listener we loop over all fields of the current class under inspection and check for the @InjectView annotation. In the event we find one, we register a custom com.google.inject.MembersInjector to inject values from the view binding map we pass in the constructor of the TestViewMembersInjector. The TestViewMembersInjector uses reflection to set a value on the instance Guice passes to us in the injectMembers() method. We inject into the field we have passed in the class constructor and take the value from the viewBindings which maps from the View ID to the actual object we have added as a binding in the setUp() method of our test. The approach of getting the field to bind to the implementation of our actual binding is a little rough but is good enough for test execution. For a more elaborate approach I suggest having a look at the roboguice.inject.ViewListener class that performs a similar action for production code. Ok, if you have made it this far you must be seriously interested in RoboGuice and testing your applications with Robolectric and Mockito. In the end it should have become clear that using RoboGuice can help you to remove the clutter from your production code by injecting required dependencies. In addition the test code becomes much more elegant while not requiring you to break any code encapsulation with test-only setters or getters. There are a couple of things to keep in mind though. When you decide to use RoboGuice you should attempt to inject everything because once you break the chain of injection, you will have to trigger injection manually which is not very elegant. Also when writing tests, you should inject the class under test if you don’t want to call the inject call manually. And finally, if you use RoboGuice together with the popular ActionBarSherlock, you face the problem that they both require you to inherit from their respective Activity/Fragment/Provider etc classes. One solution is the library roboguice-sherlock. It combines the two frameworks into one base Activity/Fragment/Provider. I’m starting to play with Roboguice as my first DI framework so I need some help for experts. because guice does not injects the views in RoboSherlocktActivity (class extending RoboSherlockActivity). If I extend RoboActivity and avoid sherlock eveything works fine. Do you have any clue? Roboguice is not able to inject activities into your test class because it does not know what activity/context to inject. You should create a custom guice module that binds the Activity.class to the activity you want to test. You can than simply inject that Activity into your test class. Guice also discourages the use of getInstance() in favor of simple injection. Hope that helps. Let me know how the issue progresses. This was super helpful to me. Thanks for all the work you did getting this environment set up. I struggled for some time getting some of my own tests to work and eventually found that Robguice 2.0 beta 4 was the problem. Sure enough when I use your sample Eclipse projects they run fine on 2.0 but on beta 4 I get the error below. Was just wondering if you have solved it yet. I am happily running on 2.0 for now but am worried that Roboguice team will be breaking this strategy in the future. 1) Error in custom provider, java.lang.UnsupportedOperationException: class android.app.Activity is context-scoped and can’t be injected outside of a context scope. Did you intend to make the referencing class @ContextSingleton or use ContextScopedProvider instead of Provider? Caused by: java.lang.UnsupportedOperationException: class android.app.Activity is context-scoped and can’t be injected outside of a context scope. Did you intend to make the referencing class @ContextSingleton or use ContextScopedProvider instead of Provider? 2) Error in custom provider, java.lang.UnsupportedOperationException: class android.app.Activity is context-scoped and can’t be injected outside of a context scope. Did you intend to make the referencing class @ContextSingleton or use ContextScopedProvider instead of Provider? I have also added some custom annotations that allow you to test different “versions” of Android, as well as load Android Library project resources, and even test different “screen size” code. Moritz is a curious software developer with a rich history in mobile development. With a strong java background, getting fluent in Android development was a natural fit. The mobile app architecture and data flow became his main area of interest.